Brian's compost heap is the scene of much ant-based drama. Here we have an ant beset by a herd of mites. 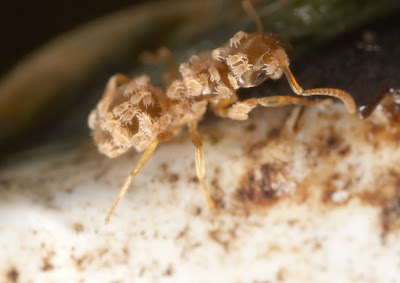 Whether the mites are just along for the ride (benign phoresy) or feeding off the ant, I don't know. But the ants know how to take care of themselves. Here we have a pair grooming and de-miting one another. 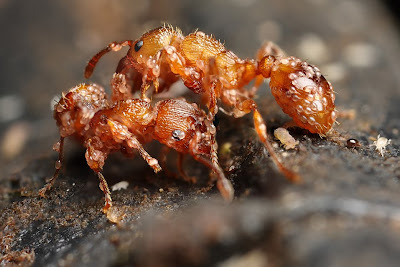 I imagine the ants have to work fast; the mites probably hop right back on if you're not quick enough -- kind of like trying to peel a toddler off your lower legs when she's got it in her mind that you've got candy she wants. Peel and run. That is incredible that they "groom" each other. Like primates. I like the "mitey" pun too. Ha. that looks soooo werid and cool at the same time i soo want to foleow you guys!